Howard has assembled an interesting collection, for the most part excluding songs you might expect. Or songs I might expect; of my 20 favorite Finn songs, only two are present. Finn, in fact, says in his liner note, “though I might have chosen differently, this much is true: anything Lisa sings is perfection.” And I agree. Howard shines throughout, traversing Finn’s sometimes quirky musical lines with ease, even as she mines the tunes’ emotional (and comic) cores. Lisa Howard has the tools of her singing trade sharpened and uses them with ultimate skill and infinite joy. And it’s a joy to state unequivocally that this is one of the finest vocal CDs to come down the pike in some time. Howard’s voice is both lyrical and expressive and her way with Finn’s lyrics is a true gift to the songwriter’s work. That this is her first CD seems crazy. She is an engineer’s dream, her enunciation perfect and her acting chops sheer magic. In “Bad Boy” another Royal Family song, she is both amusing and cynical at the same time in a 1920’s jazz idiom…not an easy combination by any stretch of the imagination. 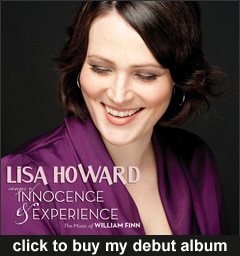 Long one of the best-kept secrets on Broadway, Lisa Howard’s vocal gifts will be out of the bag now that her debut disc, Songs of Innocence & Experience, is available on Ghostlight.